This small interface is used to simulate various loudspeaker models when using headphones. VRM stands for virtual reference monitoring. You can try it out here. Last year I tried out a pair of the new Sennheiser HD 800 headphones and they were indeed excellent (very neutral). The only down side is the cost; at $US1400 they are by no means cheap. Eventually I settled on a pair of Ultrasone Proline 650. Ultrasone is a relatively recent German company. These headphones are unusual in that the transducers are offset in relation the the axis of the ear cannel (lower and forward) and this provides an impressive spaciousness more akin to listening to a well set up speaker system. As well as this the bass is great. On the down side they are fairly heavy and slightly too uncomfortable for hours of listening. I won't get rid of my AKG K240 II's just yet. 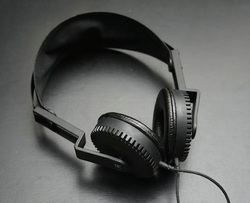 I used to have a pair of these Micro Seiki electrostatic headphones. They had a great top end with a very good transient response. The downside was the bass was a bit weak. Electrostatic transducers are interesting; the operating principle is that a membrane is supported close to and between two polarised (electrically charged) plates. For a speaker this voltage is about 5kV, whereas for headphones it is about 500V. This voltage is then varied with respect to the audio signal, which forces the membrane (or diaphragm) to move accordingly. The low mass and linear movement of the membrane result in excellent transient response and low distortion. Koss and Stax still manufacture a range of electrostatic headphones. Before I got the electrostatic headphones I bought a pair of Yamaha HP-1. The other day I came across an article on the web describing how to replace the headband, so that reminded me that they were away in a drawer and I should get them out and have a listen. I remembered that they sounded very good in their day (about 20 years ago). I was pleasantly surprised to find that they not only still sound ok, but held up very well against a pair of AKG K500. Although not unique to Yamaha, the operating principle is unusual. A 150Ω aluminium coil is attached to a disk that is mounted by its centre between two ferrite magnets. This is a similar principle to the printed ribbon microphone (or tweeter) idea introduced by some manufacturers (especially Fostex). Interestingly, the Sennheiser HD800 also uses a centre mounted diaphragm (with a voicecoil), because this gives good driver linearity.